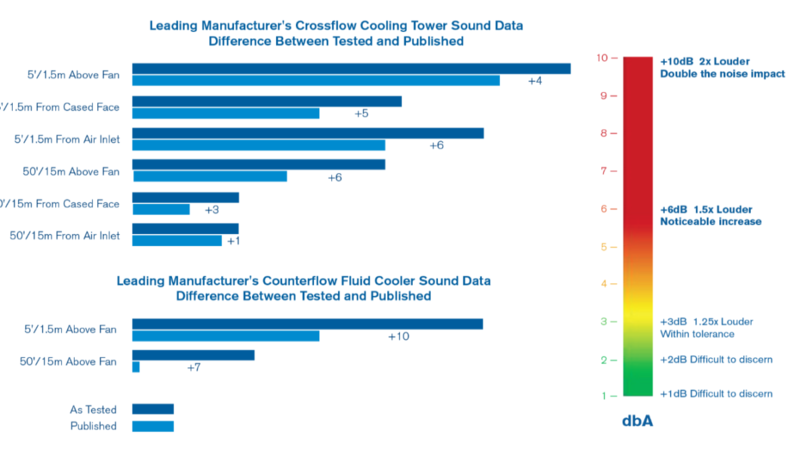 Figure 1 shows the difference between data issued by a CTI-licensed, third-party test agency using certified precision sound test instruments, compared to sound data reported by a manufacturer, for the same crossflow and counterflow cooling tower. 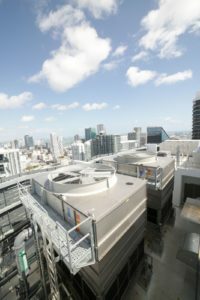 Cooling towers support large-scale HVAC systems in urban areas. 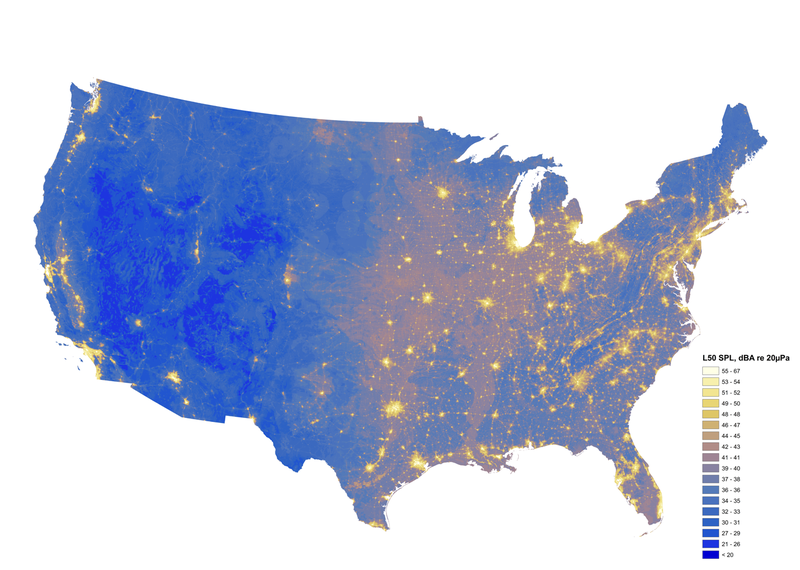 This map shows noise-polluted areas occur where population density and noisy equipment are more common. Photo Credit: National Park Service. Noise pollution is a growing concern for communities around the world. With expanding urban and industrial development, commercial buildings and process facilities are faced with increasing and strictly enforced noise ordinances. These noise directives are especially stringent in many European and Middle Eastern locations, as there is generally less land area away from densely populated areas for cooling towers to operate. In the United States, the National Park Service (NPS) has mapped out noise-polluted areas to demonstrate impacts by human influence, generally higher in urban areas and the densely populated East Coast. Cooling towers – a part of large-scale HVAC or process cooling systems – are often located near medical centers, universities, hotels, high-rise residential complexes, industrial facilities and power plants. Noise generated by towers can be a public nuisance, so directives exist to keep the sound levels of these towers and other equipment in check. Noise generated by towers in large-scale HVAC projects and industrial facilities can be a public nuisance, so directives exist to keep the sound levels of these towers and other equipment in check. When developing cooling systems, manufacturers must be knowledgeable about regulations and permissible sound levels; however, defining the actual noise or sound level of a cooling tower can be challenging. It is difficult to verify whether a measured level is accurate once the cooling tower is installed in the field, because there is no single, governing sound test criterion practiced across the cooling tower industry. Given these issues, SPX Cooling Technologies Inc., a global cooling tower manufacturer, depends on the Cooling Technology Institute (CTI) for third-party sound guidance. Recognizing the international CTI Test Method ATC-128 and following its methodology for sound testing is one way to address the challenging landscape of noise regulations worldwide. Sound is defined as a disturbance through a physical substance, perceived by the listener as a pressure wave superimposed on the ambient air pressure. Sound in the cooling tower industry is determined, or specified, in two ways. One is by sound pressure level. The sound pressure level is the sound level as it is perceived by our ears from a given distance. This level is expressed in decibels (dB), and varies with distance from the sound source. The amount by which the sound pressure varies by distance is influenced by a number of factors. In the near field (close to the source), the variation with distance does not track closely to theoretical calculations and typically requires analysis based on testing. Far field distance reductions are more likely to trend with theoretical calculation; however, they are more subject to environmental and atmospheric influences. Sound power level is the rate of sound energy generated by a source, such as a cooling tower. This level is also expressed in dB, but does not vary with distance from the sound source. Sound power cannot be measured directly. It is determined based on the theory of propagation from a source through a hypothetical surface where sound pressure measurements are taken. The quantity and location of sound pressure measurements are defined by a testing standard. Both sound level values are used by regulatory bodies and by purchasers concerned with noise pollution. Neither value is considered the standard and either could be specified or guaranteed. Each method has pros and cons. + Considers how the sound produced by a tower might be experienced by the surrounding population. + Can be measured directly with specific locations and operating conditions agreed upon between the purchaser and manufacturer. – Can make verifying tower sound level more difficult due to other noise sources, particularly for far field measurements. + Is useful to sound consultants in comprehensive models that encompass many pieces of equipment. + May minimize background influences if measurements are taken in the near field, depending on the testing standard used and test environment. – Fails to consider how the calculated sound level is experienced by the surrounding population. – Produces calculated sound values that can vary between testing standards. – Complicates calculation of sound power because the required geometric array of sound pressure measurements can be burdensome to execute. In Europe, sound power level is the more popular metric for regulating noise levels, but is not widely standardized. There are multiple global standards – ISO, DIN, EN, along with other regional codes – that apply different techniques and yield many different sound power values. It is complicated to find one universally accepted code or standard. In order to satisfy strict noise directives, particularly in Europe, some facilities specify that any cooling towers they purchase be “very quiet” (often the lowest sound pressure level available among specific HVAC equipment). In order to meet the specification, cooling tower manufacturers incorporate sound reduction technology into tower design configurations. Because incorporating special sound reduction technology into cooling towers adds cost, misleading or inaccurate sound data is not uncommon. For example, when sound pressure testing a cooling tower, readings taken from the quietest face of the tower or at nighttime when fans are running at reduced speed, can provide misleading measurements produced to comply with noise level regulations. Similar practices can occur with sound power levels. Measuring the sound power level of only one cell of a multi-cell tower, or ignoring the sound produced by falling water within the tower provides inaccurate information. In a test performed by a CTI-licensed, third-party sound test agency using certified and calibrated ANSI S1.4 Type 1 precision sound test instruments, sound pressure levels were measured and differentials compared to levels provided in a cooling tower manufacturer’s published literature. The products tested included a crossflow cooling tower and a counterflow fluid cooler, both current products offered by leading manufacturers. Figure 1 shows the data produced by these tests. The average differential between manufacturer-reported sound pressure levels from various locations surrounding a crossflow cooling tower, and the sound pressure levels tested by the independent test agency was +4.1 dB – between 1.25 and 1.5 times louder than reported. For the counterflow cooling tower, the average difference was +8.5 dB, which is nearly two times the noise that was reported. These differences are concerning. Beyond accepting sound data generated by cooling tower manufacturers, customers must incur additional expense to verify cooling tower sound levels through onsite testing. Cooling tower sound issues can be resolved by adopting a universally accepted standard that is regulated and administered by an independent third party, such as the Cooling Technology Institute (CTI), a trusted global resource. CTI is an independent organization whose mission is to advocate and promote, for the benefit of the public, the use of all environmentally responsible cooling technologies, such as wet cooling towers, air-cooled condensers, dry coolers, indirect cooling and hybrid systems. CTI provides ongoing education, guidelines, research and verification programs to continuously improve these technologies. Regarding codes, standards, guidelines, and other verification methods, CTI has adopted a sound test code titled ATC-128. This document summarizes the current state of knowledge regarding the measurement of sound from cooling towers. ATC-128 provides guidelines for instrumentation, measurement and evaluation (calculation and presentation) of sound levels – including sound pressure and sound power levels – and is intended to aid cooling tower users. ATC-128 covers all parts of the sound level testing process, ranging from determining the testing instrumentation to be used, the measurement and test layout, the proper calculation, presentation of data and more. If cooling tower manufacturers used CTI-licensed, third-party agencies to test their cooling towers and calculate comprehensive sound levels according to CTI’s ATC-128 test code, then misleading sound level data would become the exception. SPX consistently tests its towers in accordance with ATC-128. SPX has taken sound testing one step further by using third-party testing to verify test data for its most popular factory-assembled cooling towers, including the Marley NC and MD Series Towers. These towers meet sound levels as published because they are independently verified by a CTI-licensed test agent and acoustical engineer. • Request that all sound data be wholly compliant with CTI ATC-128. • Request that sound data be verified through testing by a CTI-licensed third-party acoustical test agency. • Identify any unexplained differences in sound levels and ask for clarification. • Sound attenuation options increase cost. Identify cooling towers that incorporate low-sound components by design when possible. • Crossflow cooling towers are typically quieter than counterflow cooling towers; falling water and perimeter noise is reduced. Overall, manufacturers and building owners can be good neighbors by understanding noise regulations, siting towers carefully and following the CTI ATC-128 testing standard to verify cooling tower sound levels.